Cet hôtel de luxe 7 chambre Medellin + 2ème salon convertit en 8ème chambre, grande maison 6000 sq. Ft. Au coeur de El Poblado. Excellent service, les commodités modernes, et un cadre magnifique. Quelque chose que vous ne trouverez pas dans Medellin mais seulement à cette maison est A / C. La maison a une grande baignoire 7 personne chaude, bar de porte de sortie et grand barbecue pour divertir vos invités. Une chambre familiale avec un grand divertissement 51 'LCD avec système de stero, bar intérieur, table de billard et un ordinateur pour votre usage. Maison est décorée et un grand espace social ouvert pour le divertissement. Ce manoir est situé dans un des plus beaux quartiers de Medellin, en Colombie. Les meilleurs restaurants, loisirs, casinos, Shopping et les soins de santé peuvent être trouvés à proximité. À distance de marche de la célèbre Lleras parque. Son situé sur le meilleur quartier de Medellin, en Colombie. Avez-vous besoin d'un endroit pour avoir une réunion de famille, cet endroit est grand espace social pour divertir. grande maison de 7 chambres. Location complète de la maison comprend un service de ménage quotidien. Nous offrons également la location de voitures ou le service de limousine à notre invité pour un coût additionnel., Les voyages à la maison du lac. Venez rester avec nous aujourd'hui et d'avoir la meilleure expérience de Medellin! Nous avons également plusieurs appartements à Medellin et Carthagène. Y compris un penthouse impressionnant, se renseigner pour des forfaits spéciaux. Great location and property definitely met our needs. Lucy was AMAZING with our requests and even cooked for us! She was able to recommend good eateries in the area and kept the residence clean daily. Couldn’t have asked for a better location! Minus a couple minor things around the house, our stay was excellent!! 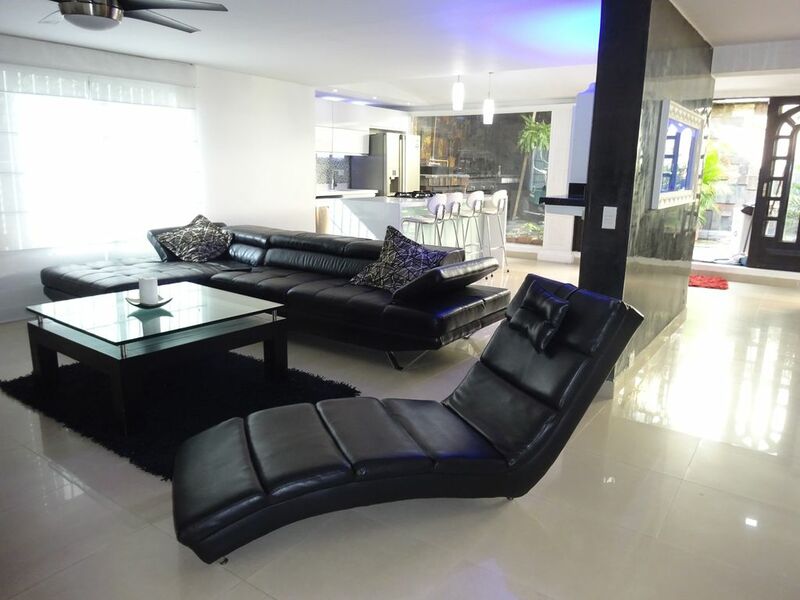 Great house in the best neighborhood in Medellin , close to nice restaurants and walking distance to Medellin's nightlife. Excellent communication throughout all the booking process and Lucy (cleaning staff) just makes your stay a lot easier , definetely coming back and recommend. Spacious house in great location. Comfortable and well equipped! Thank you!!!! We were in Medellin for our son’s wedding. This house was a wonderful home base for us. It was very spacious and well equipped. Our grandchildren loved the hot tub and the location was great for walking access to restaurants and coffee shops. The manager, Ignacio, is very responsive and Lucy, the house maid, was fabulous. Not only did she keep the place spotless but she did personal laundry and pitched in helping with the preparation of food, always with a smile. Ignacio also put us in touch with a driver, Antonio, who was wonderful. We needed vans for 10 + people to various destinations and Antonio was reliable and flexible in meeting our needs. With family members and friends coming and going, this was the perfect house for us to host gatherings before the wedding. We also felt very safe in the neighborhood. It was our first time in South America and we all loved it. I totally recommend this house for large groups. Was a lovely villa, in a great area.Lucy the housekeeper was excellent. The house is located in a safe neighborhood - restaurants, bars and shopping malls are a few minutes away. The space is huge and looks modern- two floors with 7 rooms, 8 beds and 5.5 bathrooms. There’s enough space that your group won’t feel crowded at all. Ignacio was great in communicating and check out and check in was very easy. Lucy is a great resource, reliable, nice and always made sure we had everything taken care of inside the house. I booked this house for a bachelor party for 10 guys. I must admit, when I first read reviews, I was sceptical towards their validity. Nevertheless, I saw it appropriate to find out for myself. From the second I inquired about this property to the second I took my last step out of he house, there were no problems. Ignacio was involved, responsive, and helpful throughout the process. Lucy is a sweetheart and attended to our every need. The rooms were fine, toiletries and bath supplies were surplus, wifi was decent for 10 people, and everything in the house is modern and fully functional. The neighborhood is safe and the people are nice. Word of advice is to inquire about house rules prior to booking so that you are well informed. Also, if you don't speak Spanish, get a translating app because not many people speak English. I am willing to talk to anyone looking to book this property!!! What a great experience!!! Thanks again Ignacio & Lucy for helping to make my trip easy!! !